The Southern Ocean is changing, understanding how is critical to projecting future climate Working deep in Antarctica a team from UNSW PANGEA and the Climate Change research centres are pioneering new approaches to reconstructing Southern Ocean dynamics from ice cores. Lead by Australian Research Council Future Fellow Dr Chris Fogwill, the team are developing a new technique that reconstructs past variations in marine microbial activity trapped in ice, in the form of dissolved organic matter (DOM), providing a new way of reconstructing Southern Ocean dynamics. Preliminary studies from ancient ice have demonstrated a strong and variable marine DOM signal during the past 10,000 years. 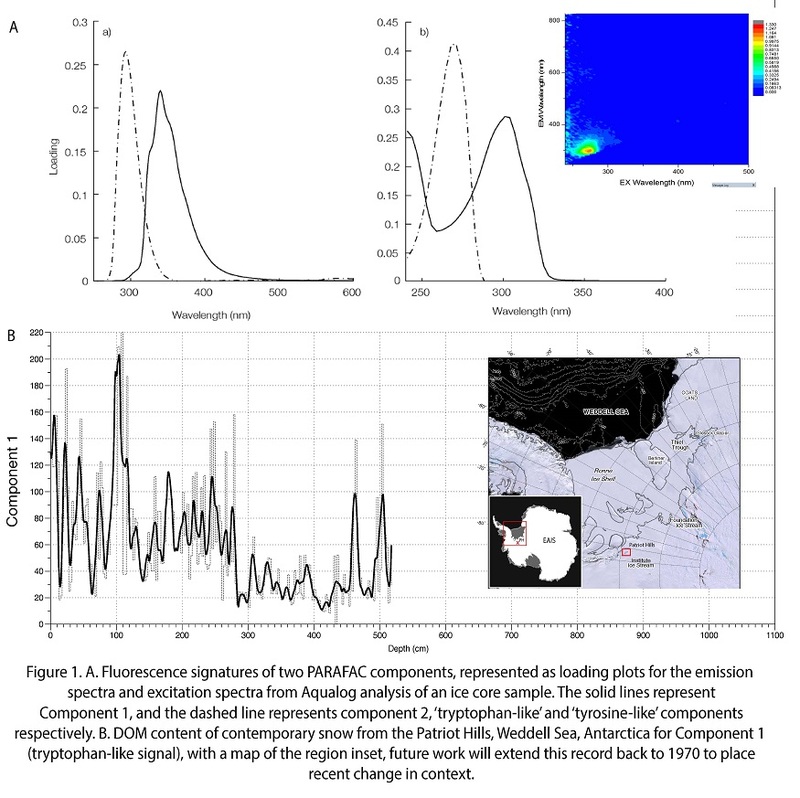 This remarkable record hints at marked variability in marine productivity that can only be indicative of physical changes in the Southern Ocean linked either to sea ice dynamics or polynya activity driven by changes in westerly airflow as defined by the Southern Annual Mode (SAM). The record has been constructed from ice samples that have been melted and non-destructively analysed using the UNSW ICELAB Horiba Aqualog, which measures the fluorescence of DOM by producing a map of the fluorescence through an excitation-emission matrix (EEM). Detailed analysis of the fluorescence emission spectra identified two protein-like components in both recent snow samples and ancient ice. Due to their emission wavelengths, we can unambiguously identify the two proteins as tryptophan-like and tyrosine-like proteins, amino acids vital for photosynthesis in marine bacteria and algae, ruling out in situ or humic sources of the DOM signal. With support from the PANGEA research group the next stage is to understand the contemporary changes captured in snow over the past few decades, to provide an analogy to investigate past significant changes in the DOM signal. To develop this into a robust ‘palaeo proxy’ that can be used to define and characterise this relationship in detail, we must define a modern analogue from snow cores taken from multiple geographical settings across the region, over common time scales, to examine the spatial (geographic) heterogeneity of the marine DOM signal. The resultant data will allow us to develop a publishable dataset from a network of sites across Antarctica on a common time scale that will define the DOM signal of climate variability that spans from the pre 1970s, and into the start of the satellite era from when changes can be well characterised. This will allow us to define relationships from which records of Southern Ocean dynamics can be related to Southern Ocean dynamics over geological timescales. The field work was undertaken as a part of an Australian Research Council Linkage Project with the support of Antarctic Logistics and Expeditions (http://ellsworthmountains.com/the-ellsworth-mountains.html).